This edited volume provides an authoritative account of recent research into infant development, containing thirteen chapters written by leading British and North American infancy researchers. Editorial sections are used to provide an integrated whole and to point the reader to similarities and contrasts between arguments developed by different authors. 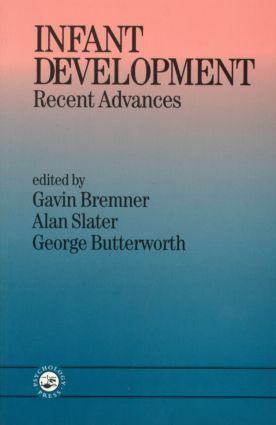 Although the chapters are organised along conventional lines into sections on perceptual, cognitive and social development, the emphasis (appearing both within chapters and in the linking editorial passages within sections) is on links between perceptual, cognitive and social aspects of development. Thus, exciting new findings on infant perception are related to both old and new accounts of cognitive development, and links are drawn between these topics and the development of social interaction and language. There is a strong theoretical component in all sections of the book, with particular attention given to both traditional approaches such as Piagetian theory, and more recent approaches such as direct perception and dynamic systems theory. There is also a chapter devoted to interpreting infant development from a psychoanalytic perspective. A particular feature of this book is its aim to make recent findings and theoretical developments accessible to a student audience with little advanced knowledge of the area. Thus the book should appeal to a wide readership ranging from advanced undergraduate psychology students to established infancy researchers. Part 1: Perceptual and Motor Development. G. Harris, Development of Taste Perception and Appetite Regulation. A. Slater, Visual Perception and its Organisation in Early Infancy. J.G. Bremner, From Perception to Cognition. B. Hopkins, G. Butterworth, Dynamical Systems Approaches to the Development of Action. Part 2: Cognitive Development. P. Willatts, Beyond the "Couch Potato" Infant: How Infants Use Their Knowledge to Regulate Action, Solve Problems, and Achieve Goals. J.C. Rutkowska, Reassessing Piaget's Theory of Sensorimotor Intelligence: A View from Cognitive Science. J.M. Mandler, Development of Categorisation: Perceptual and Conceptual Categories. M.H. Bornstein, A. Slater, E. Brown, E. Roberts, J. Barrett, Stability of Mental Development from Infancy to Later Childhood: Three "Waves" of Research. Part 3: Social and Language Development. A. Slater, G. Butterworth, Perception of Social Stimuli: Face Perception and Imitation. V. Reddy, D. Hay, L. Murray, C. Trevarthen, Communication in Infancy: Mutual Regulation of Affect and Attention. R.P. Hobson, Psychoanalysis and Infancy. D. Messer, Referential Communication: Making Sense of the Social and Physical Worlds. M. Harris, Language and its Pathology.